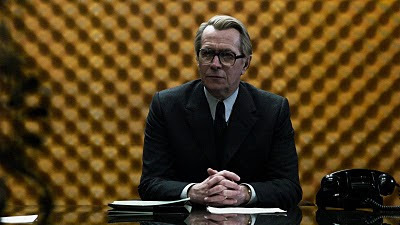 Thomas Alfredson's new film version of Tinker Tailor Soldier Spy is about as good a two-hour movie as I can imagine being made from John le Carré's spy novel. In 1979, the BBC adapted the story into a seven-episode miniseries that has subsequently been hailed as a TV classic, so how can we expect a single movie to compress such a complex and slow-burning plot into a fraction of the time without losing some sense of complexity or depth? The good news is that the film stands up to the inevitable comparisons to both the source material and the television version and comes out of it looking pretty good. Sure, it may not be the definitive Tinker Tailor Soldier Spy, but the fidelity and integrity that screenwriters Bridget O'Connor and Peter Straughan have shown in adapting le Carré's story is admirable, and as a showcase for both a gifted young director and the cream of British acting talent, the film is hard to beat. The first thing one notices about Tinker Tailor Soldier Spy is how superbly Alfredson and his team have nailed the atmosphere of the world that the story takes place in. This is a tale of spies and double agents, but there is nothing overtly thrilling about the manner in which the film is presented. George Smiley (Gary Oldman) is a British Secret Service agent forced into retirement along with head of the agency Control (John Hurt) after a bungled mission in Budapest results in one of their men being ambushed. However, there is talk of a Soviet mole "right at the top of the Circus" and as a man who is now on the outside Smiley is the perfect candidate to find out who exactly the traitor is. As Smiley, Oldman gives the most reserved and minimalist possible, sinking into the role of a character who keeps his cards close to his chest at all times, a character who has taken the notion that "careless talk costs lives" to his heart so literally that he barely utters a word. It's a central performance of remarkable restraint and subtlety, and it's also an entirely selfless piece of acting, providing the film with a calm anchor and allowing other actors to steal the limelight with their more animated turns. Of these, Tom Hardy (as the anxious agent Ricki Tarr), Benedict Cumberbatch (as the man Smiley enlists to help him find the truth) and Mark Strong (as a former agent trying to start his life anew). It seems harsh to pick out individual performances, though, because the whole ensemble excels, with some wonderful actors maximising their impact with just a few minutes of screen time (Simon McBurney and Kathy Burke particularly). It is an embarrassment of acting talent and their ability to instil their characters with immediate depth and texture is vital in a film that has little time for introductions. Because there is an awful lot of plot to cram into Tinker Tailor Soldier Spy. As written by le Carré, the story is paced in a measured fashion and steadfastly refuses to juice things up with action when a quiet conversation will suffice. By necessity, the film condenses this narrative but through some judicious editing and utilisation of flashbacks and expository scenes, it manages to keep the plot moving while maintaining the deliberate rhythms of le Carré's storytelling. Alfredson orchestrates so many scenes beautifully, from the fateful Budapest ambush outlined above, to Ricki's nervous adventure in Istanbul and a gripping attempt to steal valuable documents from deep within the bowels of the Circus. Every frame of Tinker Tailor Soldier Spy is crafted with love and attention to detail, which is why it pains me so much to say that there's something missing at the heart of it all. Maybe it's just that – heart. Tinker Tailor Soldier Spy is an immaculate piece of work, with the rich but unfussy production design and artistically drab cinematography immersing us in the world of its characters, but while I found myself admiring every aspect of the film individually, I just couldn't love the whole. The film wants you to believe that there's a torrent of suppressed emotion hiding behind these closed-off façades, but I never felt it, and the manner in which the film kept me at arm's length throughout meant it ended up falling short of where each aspect of its production seems to place it. Tinker Tailor Soldier Spy is in many ways a film about love – the love of one's country, the love of a woman, the love of one's fellow man – and what it feels like when that love has been betrayed, but the characters and the filmmakers keep those feelings buried too deep to have any real and lasting impact.